The Foreman is NOT (4WD) four wheel drive but I have yet to get it stuck. Please contact me for details by calling the number below and don't forget to mention that you found this ad on GoGoCycle's Used Motorcycles and Parts for Sale www.gogocycles.com. GoGoCycles encourages bikers to submit a review of the 2005 Honda Foreman 500 for Sale to make the biker community aware of any problems that are commonly associated with the Foreman or to highlight its positive features and help potential buyers make informed decisions. In my opinion you won't get a better deal on a used Honda Foreman for sale in Crooksville, OH near Columbus OH Ohio on Craigslist or on Ebay. $3000 is a great price for the used ATV for sale in this ad so call me at 740-621-6zero33 and don't forget to mention that you found this ad on GoGoCycle's Used Motorcycles and Parts for Sale www.gogocycles.com. Join in and write your own page! It's easy to do. How? 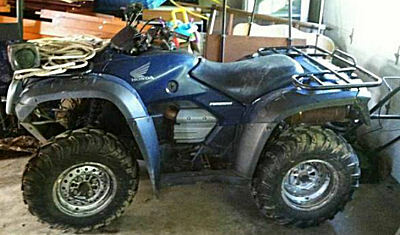 Simply click here to return to HONDA ATV for SALE.